I am very pleased to be amongst you today. I am delighted to speak a few words in the concluding session of the conference. 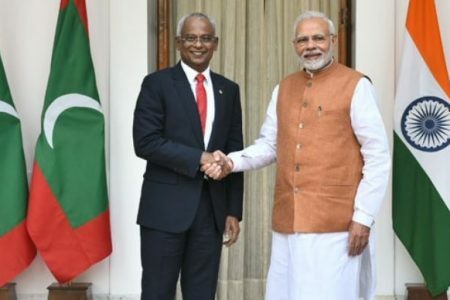 Before I do so, let me extend a very warm welcome to all of you, especially our valued guests from neighboring countries and all other friendly countries, in this land of Lord Buddha, the apostle of peace and humanity! Also a warm welcome to our country, the land known for its matchless beauty, both in terms of nature and culture, and hospitable people. Thank you for accepting our invitation to attend this conference. You have honoured us with your participation and motivated us to do more for the development of this holy land. We stand for a common cause: a peaceful, just and humane world. And, we make this solemn commitment here on the very special occasion of Buddha Jayanti. I believe our distinguished guests have enjoyed their stay in Lumbini, a treasure land of historical, religious, cultural, archaeological and artistic importance. We are assembled here in the revered place where Buddha was born. Lumbini is not only the birthplace of Buddha; it is the fountain of light that kindled his quest for enlightenment. Buddhism originated here in this place, as we cannot separate Buddha from Buddhism. It is also impossible to separate the early life of Buddha and Enlightenment. Nor his birthplace can be detached from his life and contribution he made. In essence, the link between Buddha, his birth place, Lumbini and Buddhism is inseparable. This firmly establishes the fact that Lumbini is the fountain of Buddhism. Today, Lumbini is increasingly becoming a center of attraction for tourists, pilgrims and scholars from all over the world. It has also become a centre for the study of, and research on, intellectual riches of Buddhism. Lumbini is more than this. It is the fountain of world peace and harmony. It is the fountain of non-violence. It is the fountain of humanity. It is the fountain of love, compassion and tolerance. It is the fountain of knowledge and wisdom. It is the fountain of all human virtues. This multidimensional fountain will continue to inspire our thoughts and actions and we take a great pride in hosting this world heritage site as precious and timeless asset for humanity. I trust that the conference has been highly productive in generating more insights and deeper level of understanding on the theme of the conference. Deliberations on Buddha’s immortal teachings have a great relevance in contemporary world. The messages of Buddha always guide those in pursuit of peace, tolerance and harmony. They are central to promote the culture of peace, dialogue of civilization and cultural harmony. The word ‘Buddha’ means ‘one who is awake’. Buddhism is thus the process of awakening. A process of transformation from darkness to light, ignorance to truth, illusion to realization, wilderness to illumination, vices to virtue, chaos to order and helplessness to self-empowerment. It is the state of the realization of the self, and thereby an ascent to the noblest state of selflessness. It is a way of life replete with virtues that stand as the very identity of being truly human. Ultimately, Buddhism is rediscovery of humanity. Much beyond, Buddhism means the seeking of harmonious organization of society and world order. Order that is based on justice, universal fraternity, peaceful co-existence, harmony with nature and human dignity. What Buddha taught centuries back have not only become a way of life for millions of Buddhist followers around the world but have also increasingly become a part of international norms and values, including those enshrined in the Charter of the United Nations. 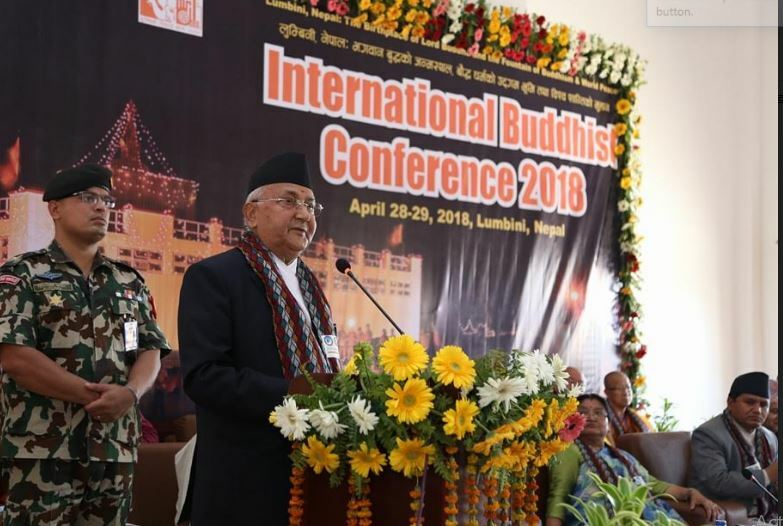 This should undoubtedly be a matter of immense pride not only for Lumbini that nurtured the early sapling of Buddhism but also for the entire region where Buddhism has become a shared asset. Our region gave birth to Buddhism, one of the world’s most revered philosophical system, at a time when the majority of the rest of the world was confined to the darkness of superstition. Together with the great teachings of Buddha, ancient Asia provided to the world countless civilizational attributes– from literature and architecture to physics, metaphysics and medicines; from idea of statecraft to art of trade and industry. This part of the world was home to great civilizations and gave birth to great thinkers, leaders, innovators, explorers, scholars and researchers. Asia’s identity was rich in the past– be it in terms of level of intellectual advancement or the level of physical development. The past 200 years have remained a time of exception, when most of the world went ahead of us and we lagged behind. Poverty and backwardness became Asia’s identity. Today, the scene is once again changing. Our ways and our values are getting greater traction worldwide. These are the core Asian values of universal fraternity, peaceful co-existence and sense of equality that guide our ways and can stand as a fortress to ensure world’s peace and security and sustainability of its development. Asian values have the potential not only to bring us, the Asians, closer but also contribute to the world’s better future. We, of course, are fully cognizant of how great the contributions of Buddhism have been in shaping up these precious values. Asian values are not a new phenomenon. These values were born out of our collective, civilizational conviction on harmony, discipline and primacy of the larger public good and interest over petty individual self-centeredness. Our values put more of an emphasis on sharing, caring and co-existing. We are guided by a firm sense of tolerance of diversity. Responsibility, therefore, befalls us to glorify our rich civilizations, our oriental values and philosophies on a global scale. We must make concerted efforts to project our rich cultural heritage as an embodiment of our collective identity. I take this conference as an important initiative in this direction. Buddhism, as a philosophical system and a way of life, has a universal appeal. This should be understood in terms of our core human values and a common destiny. It is about peace, non-violence, compassion, harmony and forgiveness. These are higher noble causes that bind human beings together and transcend boundaries and demarcations of every kind. Buddha’s renouncement of all worldly pleasures at the royal palace, quest for truth and attainment of enlightenment speak volumes about his perception of the essence of human life. His teachings emphasize the need of working for the happiness of many and for others rather than for oneself. During its roughly 2.5 millennia old history, Buddhism has shown a flexible approach, adapting itself to different conditions and local ideas while maintaining its core tenets. As a result of its wide geographical expansion, coupled with its tolerant spirit, Buddhism today encompasses a number of different traditions, beliefs, and practices. Today, values of Buddhism become all the more important when divisions and demarcations rather than a sense of solidarity and fraternity; schism and fundamentalism rather than global norms have gained footing in many parts of the world. Buddha’s timeless teachings of peace, non-violence, compassion, harmony and forgiveness are truly universal beyond the narrow confines of geography, ethnicity, cast or creed. The concept of ‘middle path’ that Buddha asked his disciples to follow permeates the overall philosophy of Buddhism. This path stands for a balance between two extremes – a life of self-mortification in the name of religious practices and a life of mere sensual pleasure. This notion takes an intermediary approach in relation to spiritualism and materialism. It is equally important for us today as we continue to get entangled in the ‘wheel of suffering’ due to our insatiable craving for material resources. Expressed in simplest form of expression, the Four Noble Truths capture the most undeniable essence of human life while the eightfold path remains the guiding light for honest living. What fascinates people towards Buddhism in the age of science and rationality is its focus on the human and natural environment. There is no pre-life or post-life. Emphasis is rather on making this life worthy and great. Buddhism shuns servitude and fatalism. It teaches us to delve into the self and seek freedom from temptation. Buddhism is thus about self-transformation, self-organization and self-discipline. It is about a balance between the transient and the eternal, the triviality of human life and the highest form of its noble stature. It never trivializes life but tells us of the need and importance for constant striving to improve oneself – to attain a higher calling and to reach a stage of enlightenment. Buddhism has taught the world the art of meditation. And meditation has become increasingly popular as its proven benefits to both mental and physical well-being are becoming more widely known. When stress is shown to be such a major cause of human suffering, the quieting practice of meditation becomes ever more valued. From this small town of ancient Nepal, where we have assembled today, started the journey of Buddhism. As it travelled to the rest of Asia and to the world, it carried with it the huge reservoir of knowledge and wisdom, aesthetics and spirituality, way of life and pattern of social organization. Buddhism thus became larger than life. The earliest monks, nuns and Buddhist scholars rendered great service to humanity not only as carriers of faith but also the connectors and linkages among peoples. Apparently without intending to be so, they became the pioneers of global interconnectedness. In view of the importance of Lumbini as origin of Buddhism and also a treasured archeological site, Nepal has been making all possible efforts for Lumbini’s development. And in this endeavor, we have received valuable cooperation from around the world. We want to develop this area as an international Peace City and a holy shrine for all humanity, for all Buddhists across the world, and for those who have interest, belief, and faith in the principles laid by Buddha. 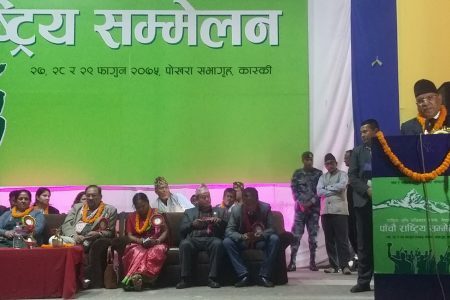 We are focused on completing master plan for entire Lumbini region at the earliest so that new developmental works can be undertaken in a systematic manner. We are effortful to protect and preserve the archaeological relics in the greater Lumbini area. The Lumbini Development Trust is mandated to carry out the works of restoration of Lumbini Garden.We also aim at promoting and developing Lumbini as the canter of International Buddhist Studies. We acknowledge the important contributions of researchers and scholars. We also commend the Lumbini Buddhist University for taking the lead in this sector. Lumbini and Buddhism have also attracted some attention at the international front. Our neighbours and friendly countries have extended, since long, their generous support and cooperation to Lumbini’s development. The United Nations General Assembly Resolution recognized ‘the Day of Vesak’ in 2000 thereby acknowledging Buddhism’s contribution to the spirituality of humanity. The contribution from UNESCO and UNDP especially after Lumbini was recognized as the World Heritage site in 1997 has been remarkable. The International Committee for the Development of Lumbini was established in 1970 with the active support from then then Secretary General of the UN. However, much still remains to be done. There is a need to promote Lumbini as the birthplace of Lord Buddha, as the origin of Buddhism and as a site of world peace. For this, more studies, researches and further scholarly engagements need to be undertaken. Dissemination of messages of Buddhism and Buddhist literature can be helpful. This will also need further support and cooperation from the international community. We hope we will continue to get such support in the days ahead as well. As I stand before this august gathering to commemorate the day of both of the great apostle of world peace, I am honoured to share with you some thoughts on the achievements Nepal has made in peaceful political transformation. Having accomplished the historic task of constitution making through a democratic process in 2015 and concluding the democratic elections of all three levels of federal set up in 2017, Nepal has reached historic milestones in its quest for peace and prosperity. For the first time in recent history, we have been able to form a democratically elected government with strong popular mandate on which people have reposed enormous faith. People are now looking to us with abounding sense of optimism that their dreams for better life would be materialized. My government is committed to translate these dreams into reality with the motto, ‘Prosperous Nepal, happy Nepali’, and this auspicious occasion may provide us further inspiration to this end. Tomorrow, we will mark a special occasion. It was on this full moon day of Vaisakh that an immortal son of the world was not only born but also achieved enlightenment and finally assimilated in the eternal peace. Let’s work together to ensure peace, harmony, understanding, tolerance and justice in the world. Let’s promote the values of Buddhism for the common benefit of all mankind. Let’s forge a strong partnership to make Lumbini a center of global peace, harmony and understanding. Our collective duty is to establish a peaceful, stable, just and prosperous world where all people can live with dignity and honor without any fear or intimidation. Lumbini can contribute to the achievement of this lofty goal.